In late November 2003 I attended the Society of Biblical Literature and American Academy of Religion annual meeting in Atlanta, Georgia, where nearly 10,000 professional Bible scholars and theologians gathered to listen to papers on specialized topics at a luxurious convention center. While in Atlanta I contacted the founders of an inner-city homeless shelter called the Open Door Community, who invited me to travel down on a Sunday morning in one of two vans full of homeless people to attend the annual protest a few hours drive South at Fort Benning demanding the closure of the School of the Americas—a military base where thousands of police and soldiers from Central America’s elite units had been trained during the 1980’s. Tens of thousands of poor peasants, labor leaders, priests and other activists were tortured and killed by troops and intelligence agents trained at this base by US military advisors paid for by US tax dollars. There at Fort Benning I joined a throng of some 10,000 protesters gathered that day from all across the US and Canada who peacefully march in a funeral dirge commemorating Latin America’s martyrs up to the fence at the entrance of the base between rows of mounted Georgia State Patrol and Police. I feel sorrow over mainstream American ignorance of the US’s involvement in supporting oppressive regimes and pain at the near absence of any recognition of their culpability as the protesters around me lifted white crosses and call “presente” after every name. My heart is so heavy that I cry on and on as I walk towards the base. I have been despairing about the war in Iraq, and the American public’s general agreement about how the “war on terrorism” is being waged. What am I doing to resist our national direction? I am a man of unclean lips among a people of unclean lips. I remember feeling this acutely when I first visited Guatemala, Honduras and Nicaragua in 1981 and became aware of our national guilt. There I had felt for the first time the God with us (Americans) shift to a God against us and with them in a way that forever changed my life. I walk with my head hung low, up to the fence where some were preparing to cross over to be arrested in an act of civil disobedience. Scores of Military Police stand ready to make arrests, clusters of plastic hand cuffs attached to their belts. Someone plays loud patriotic music through a megaphone. Regular announcements are blasted through speakers warning the protesters that they will be arrested if they step foot onto the base. Do not fret because of the wicked; do not be envious of wrongdoers, for they will soon fade like the grass, and wither like the green herb. Trust in the Lord, and do good; so you will live in the land, and enjoy security. Refrain from anger, and forsake wrath. Do not fret—it leads only to evil. For the wicked shall be cut off, but those who wait for the Lord shall inherit the land. Yet a little while, and the wicked will be no more; though you look diligently for their place, they will not be there (Ps 37:8-10). I have seen the wicked oppressing, and towering like a cedar of Lebanon. Again I passed by, and they were no more; though I sought them, they could not be found (Ps 37:35-36). The truth of this Psalm is impressing me. At the same time more questions are arising. “Who are the wicked?” I ask. As I look out through the fence I’m noticing that most of the soldiers are African American. “Certainly not them,” I think. So many soldiers are seeking a way out of poverty, a future that beats the streets or jails and prisons. Deep in my heart I am receiving a strong impression, almost a prophetic word: “The US is on its way down as a global empire. America will fall. The time is short. These are dangerous times.” I know that we are in trouble. 911 gave us an opportunity to change our way of thinking—to repent of a way of wielding power that has gained us many, many enemies. Yet we act like we are invincible. The power of pride is an illusion. “Pride goes before destruction and a haughty spirit before a fall,” I remember from my required grade school memory verses. Yet a little while, and the wicked will be no more; though you look diligently for their place, they will not be there. But the meek shall inherit the land and delight in abundant prosperity (Ps 37:10-11). You have heard that it was said, “You shall love your neighbor and hate your enemy.’ But I say to you, Love your enemies and pray for those who persecute you (Matt 6:43-44). Say to this people: see see, but do not perceive, hear hear but do not understand. Make the heart of this people calloused; make their ears dull and close their eyes. Otherwise they might see with their eyes, hear with their ears, understand with their hearts, and turn and be healed (Isa 6:9-10). I can see that the national blindness and deafness of Isaiah’s time is now being replayed in our own. I dread the consequent fulfillment of this word in the verses that follow, which describe a more severe judgment coming that echoes the words of Psalm 37. I hear the imperatives of Isaiah: “Cease to do evil, learn to do good; seek justice, rescue the oppressed, defend the orphan, plead for the widow (Isa 1:16b-17). Is it too late for mainstream America? As long as we are convinced that our problems are due to an abundance of wickedness that we must combat, we will be in serious trouble. We need to learn to turn over the problem of the wicked to God and focus instead on the remedying the tragic absence of goodness. In the absence of good all efforts to combat evil are doomed to failure. Do not be overcome by evil, but overcome evil with good. As our two vanloads of homeless men and shelter volunteers drive home, I talk with as black man fresh out of jail whose been estranged from his son, whose now in prison. He’s afraid to reestablish contact. He doesn’t want to disappoint his son again, or risk being rejected when he makes an effort to step back into relationship. I encourage him to write his son a letter. We talk with others about reading the Bible and relate it to the struggle to stay clean and sober. They let me off at the fancy hotel where I’m staying and I walk back into the Society of Biblical Literature and American Academy of Religion meeting. I return to the vast array of papers being presented, book tables and scholars visiting among themselves. I am a man of unclean lips living among a people of unclean lips. Will we keep on seeing but not perceive? How long Oh Lord? Like Isaiah, the prophet Jeremiah reflects a prophetic stream announcing judgment to the people of God, at that time embodied as Israel. God called Jeremiah to announce Judah’s destruction at the hands of the Babylonians (Jer 1:13-17). God empowered Jeremiah against the entire religious and political establishment of Judah. Now, gird up your loins, and arise, and speak to them all which I command you. Do not be dismayed before them, lest I dismay you before them. Now behold, I have made you today as a fortified city, and as a pillar of iron and as walls of bronze against the whole land, to the kings of Judah, to its princes, to its priests and to the people of the land. And they will fight against you, but they will not overcome you, for I am with you to deliver you,” declares the Lord (Jer 1:19-19). The prophets Isaiah and Jeremiah invite a resistance alongside the oppressors on behalf of the oppressed to the point of even going down with them into exile. For those already in exile, a whole other model exists for prophetic ministry to those in exile. I recognize that Isaiah 40-66 offer an empowering image of ministry that recruits the downtrodden as God’s change agents and begin to think on this. Abraham and Sarah, the founding couple of Judaism, Islam and Christianity need to be rediscovered and followed out of Babylon into a new way of thinking outside the impasses of USA, Israel/Palestine and Islamic nationalism. Today when “us-them” distinctions have never been more destructive, those who claim to follow Jesus must be clear about our identity as bearers of Good News to all people. Focus on the particularities of our heritage as heirs of the promise given to Abraham and Sarah must be balanced with the deeper meaning of our founding stories in sacred Scripture. “Go from your country and your kindred and your father’s house to the land that I will show you. I will make of you a great nation, and I will bless you, and make your name great, so that you will be a blessing… in you all the families of the earth shall be blessed” (Gen 12:1-4). Abraham was called to leave his nationality, ethnicity and family for a new place that the Lord would show him. Abraham and Sarah were called to break allegiance with the particulars of their identity, following a God who promised to bless them so they would be a blessing to all the families of the earth. Yet the particularity of Abraham and Sarah as Iraqis and Jews is not lost. When exiled to Egypt, Abraham and Sarah were believed to have acquired an Egyptian slave, Hagar, who bore Abraham, Ishmael (50% Egyptian and 50% Iraqi), YHWH blessed Hagar and Ishmael (Gen 16, 21), but insisted that the child of the promise would be from Abraham and Sarah– 100% Iraqi!? The Jews then clearly are linked to Babylon/Iraq by blood, and are inescapably brothers and sisters with their Arab/Muslim enemies. On the other hand, God clearly called these Iraqi/Jews to a universal mission that goes far beyond narrow ethnocentric, nationalistic, ideological or religious agendas. Abraham and Sarah were called to leave their nation/ethnicity/family and land– heading off by faith to a land that YHWH would show them. God called them to leave and to follow, assuring them that they would be blessed and that through their descendants all the families of the world would be blessed. This is the true vocation then of the Jewish people, and of their Iraqi ancestors. This vocation to be a universal blessing is at the heart of all heirs of the promise to Abraham and Sarah, whether they be Jews, Muslims or Christians. Babylon/Iraq has its dark side in the sacred story that must not be overlooked. Imperialist Babylon invaded Judah, slaughtering people, destroying the Jewish temple, and carrying off thousands into exile. The prophets warned the people of Judah that God’s judgment would come as a natural consequence of disregarding their true vocation as God’s people. Israel had been lured away from total allegiance to God by the seductive idols of that time. The children of Abraham and Sarah abandoned their universal mission, which was evidenced by the growing gap between the rich and the poor, abuse of foreigners, exploitation of the poor and the unrestrained accumulation of wealth. Yet there in Babylon (Iraq), the Jewish people experienced God’s revelation and blessing. 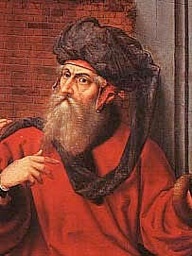 In exile they compiled and edited the Hebrew Scriptures, developed elaborate oral traditions which later served as the basis of Judaism (the Babylonian Talmud) and prepared for a new departure, an exodus to a new way of life and liberation inspired by Abraham and Sarah and the Exodus from Egypt. They returned to the land to try once again to be faithful to their original vocation on behalf of every family on earth. All who follow the narrow path of faith are included as sisters and brothers of our Iraqi predecessors, Abraham and Sarah. The Apostle Paul argues in Galatians 3 that “those who believe are the descendants of Abraham” (Gal 3:7) as “those who believe are blessed with Abraham who believed” (Gal 3:9). Non-Jews are brought into the universal family of God not through adherence to the particulars of the Jewish law, but by grace through the life, death and resurrection of a very particular Jewish law-breaker—Jesus of Nazareth. This “descendant of Abraham” (Gal 3:16) realized Iraqi Abraham and Sarah’s vocation, saving the world from the “us-them” distinctions that come through clinging to particularity over the larger universal picture. “In Christ Jesus you are all children of God through faith… there is no longer Jew or Greek, there is no longer slave or free, there is no longer male and female; for all of you are one in Christ Jesus. And if you belong to Christ, then you are Abraham’s offspring, heirs according to the promise” (Gal 3:28). All children of Abraham and Sarah are beneficiaries of God’s promise of blessing which must be passed on freely to all the families of the earth. This is a universal, borderless blessing that far exceeds any nationalistic idolatries. The requirement: leave nationality, ethnicity and family allegiances and join God’s universal human family—the reign of God. The heart of the Lord’s prayer is for God’s Reign to come and will to be done on earth as in heaven. In stark contrast to this prayer are current nationalistic agendas, visible in Israel, Iraq and in the U.S.A. The leaders of the United States of America claim to have a mandate supported by the majority of U.S. citizens and even from God to impose their “enlightened” will on the rest of the world. Many Christians and Jews support the Bush Administration, believing that war, violence, economic sanctions and a host of coercive measures are justifiable and even God’s will. While Iraq’s leaders have an oppressive record and are far from embodying the faith of their ancestors Abraham and Sarah, the USA must recognize that we are in grave error too. The USA’s attacking of the departure point of Judaism, Christianity and Islam makes it clearer than ever before that the new Babylon is now out to completely replace the old—establishing itself as the self-declared global deity. This action represents the limited self-interest of a wealthy elite, with no thought to the universal mission and saving way of the suffering Messiah, Jesus– the most total, realized descendant of Abraham. God’s descent from power and privilege into human flesh in Jesus Christ shows us a very different way of life-giving service on behalf of the least (Phil 2:1-11). Jesus’ giving of his life on the cross shows us the means and the person through whom universal salvation is accomplished. While Jesus’ way of the cross clearly looks like weakness and foolishness to those who are on their way down (perishing), the Apostle Paul is audacious in his insistence that Jesus reveals the power of God (1 Cor 1:18). “For God’s foolishness is wiser than human wisdom, and God’s weakness is stronger than human strength” (1 Cor 1:25). Christians cannot claim from Scripture that violence and war are justifiable. Nowhere in Jesus’ teachings is violence justified, nor are traditions from the First Testament (the “Old Testament”) that apparently support violence embraced by Jesus. Rather, Jesus and other New Testament writers consistently distinguish between flesh and blood enemies and spiritual enemies. Jesus clearly distinguishes spiritual enemies who he combats with violence (breaking down dividing walls, abolishing the law, and putting to death hostility (Eph 2:14-16), subjugating principalities and powers and destroying death (1 Cor 15:24-27)) from enemies of flesh and blood (human beings like Saddam Hussein, Osama bin Laden, members of al Queda or George Bush for that matter) who he calls us to love and pray for (Mat 5:38-48). “But I say to you that listen,” says Jesus, “love your enemies, do good to those who hate you, bless those who curse you, pray for those who abuse you (Luke 6:27-28) (See also Romans 12:14-21). “For our struggle is not against enemies of blood and flesh,” writes Paul, “but against the rulers, against the authorities, against the cosmic powers of this present darkness, against the spiritual forces of evil in the heavenly places” (Eph 6:12). Make no mistake, the way of Jesus is a very different way. Prayer, Scripture study, worship and other forms of spiritual resistance together with the building of a new community in the midst of the old are all arms for the struggle. We are warned that this narrow way may well lead to persecution, resistance, and even to death. Yet we are also assured that this way is the only way to true victory, life, and resurrection. Now as the new Babylon literally replaces the old, Christians must listen attentively to the imperatives of Revelation: “Come out of her, my people, so that you do not take part in her sins, and so that you do not share in her plagues, for her sins are heaped high as heaven, and God has remembered her iniquities (Rev 18:4-5).